“Paper”, in the collector sense, is a term that describes the original, physical, written, history of an object. Most times “paper” is a mundane succession of registrations and titles, records that describe a car’s ownership history. “Paper” in that sense may translate to “provenance”, the succession of recognized collectors and museums through which it has passed and reinforce its – in our case a car’s – recognition over many years as valuable or significant. But there is other “paper”, notably the three boxes of Sebring race records from the files of Sebring founder and impresario Alec Ulmann that were offered by Bonhams at their “Preserving the Automobile” auction at the Simeone Museum in Philadelphia on October 7, 2013. There was wonderful stuff among the Ulmann lots. His Hispano-Suiza records sold for $7,500. A 1940 ARCA road racing regulations brochure, the foundation of road racing in the U.S., brought $475. It was three boxes full of old programs (some still twine-wrapped from the printer), regulations brochures; a box full of old paper – letters, telegrams, drafts of entry lists – copies of unobtainable old time sheet booklets from the Fifties, and more, with a pre-sale estimate of $1,000-$2,000. Reviewed circumspectly, before the sale, they were the crown jewels of the offering. How often do the original communications between organizers, sanctioning bodies, the race site and entrants become available? How many even survive in some family’s storague unit of grandpas or grandmas letters? The Ulmann files contained flimsy old onion-skin air mail letters, fragile carbon copies that might disappear with a sneeze. It was scary just to touch them: irreplaceable letters and telegrams stuffed into files, curled and folded. Maybe you get the idea. It is the history of America’s first international road race, on paper. ‘Twasn’t easy. Freelance writers don’t have deep pockets. This was a campaign, a fraught campaign. Sold deep in the Ulmann section of the auction, Rupert Banner opened the bidding with a commission bid (i.e., an absentee bidder who’d placed an opening and high bid before the sale) of $1,000. Bids came from throughout the Simeone Museum. I raised my paddle early. Rupert recognized me as the default bidder, but kept looking down to the commission bid and quickly raising. The room dropped out at the $2,000 commission bid. Wait, wait … Rupert dropped the hammer. I’m not ashamed to say that I raised my arms like the winner of a marathon, my bidder number high in the air. It’s a segment of the early history of road racing in America, reduced to anecdotes from the original players. It just doesn’t get any better. The challenge now is to preserve this irreplaceable archive of original documents, make it available to historians and recover at least some of my investment. I’ve confessed to Ellen (wife and life partner) and it’s OK. The story isn’t over. 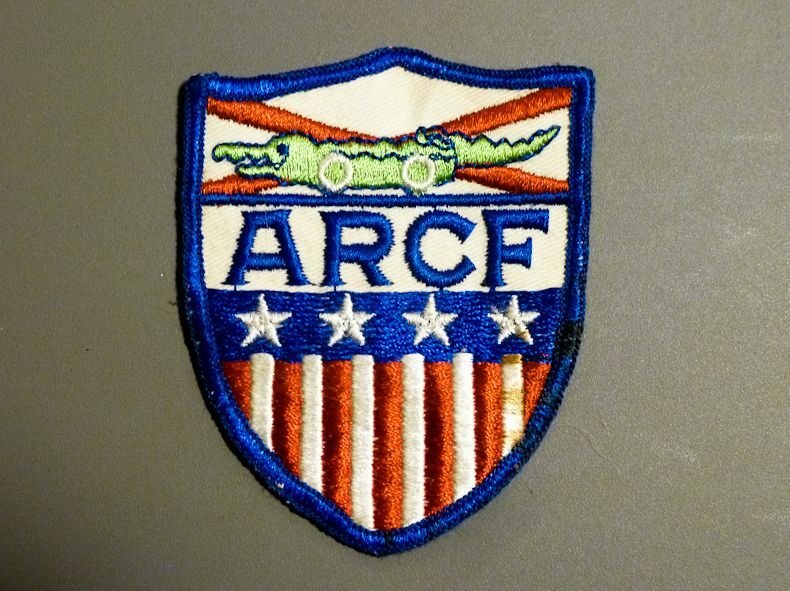 In fact, it’s just begun, but it’s a whole new window on what Alec Ulmann and his team at Sebring went through that will, I hope, illuminate early American road racing history. This is more than “paper”, it’s history. I shiver when I think what I have, and what I have to do to preserve and make sense of it so it isn’t lost. Mr. Ulmann provided me nearly four decades ago with a full set of his race programs that I would like to properly dispose of at this time. Mr. Carey, hope there is a book in this for you – I’m sure it would be quite interesting but a lot of work. Rick, I had a nice conversation with Arthur “Skip” Cooke about his dad’s involvement with early Sebring. You might find his name in the Papers. Skip drives a Lotus XI in vintage events. Rick, Do the Papers contain chassis id numbers for the Elvas entered in the 1958 race? The ifo would clarify much speculation among us Elva MK II and MKIII owners. I’ve been looking for records of the 1962 Sebring 12 hr support race for Formula Junior. I have the Team Rosebud Lotus 20 that was crashed by Chuck Parsons late in the race. Are there any records of this race. Pat Pigot won in the team’s other 20. Unfortunately for us spotters the organizers of races years ago seem to have had zero interest in chassis numbers. I have yet to find reference to a single one among all the trivia and correspondence in these files. More’s the pity, but I’ll keep looking. I don’t know if you noticed it, but there is a very interesting collection of correspondence with the CSI regarding the weights and engine power classifications for 1964 prototype classes that made the GT40, Chaparral, Cobra Daytona and Corvette Grand Sport uncompetitive. Ulmann and Reg Smith conducted a campaign to get the FIA to revise the categories and there’s correspondence from Ken Miles at Shelby and others with regard to it. An intriguing sidebar. 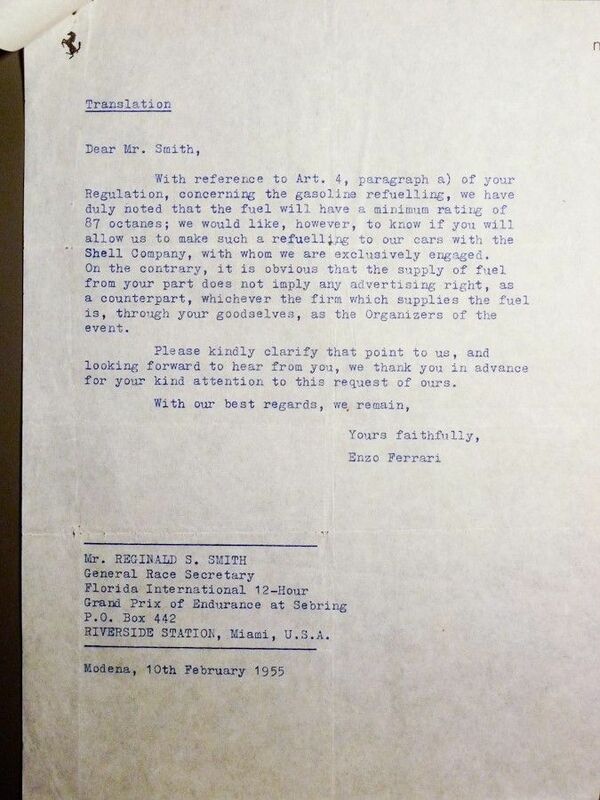 Things like a telegram addressed to Ulmann at the Hotel Oxford & Cambridge in Paris, “Duntov would guarantee lightweight if weight restriction lifted” signed “Floracing”, i.e., Reg Smith. Skip Cook told me his dad went with Uhlman (sp?) to Paris to convince M.Bonet to enter a Team of cars at Sebring. Must have been ’53-’55 or so. That might explain why Uhlman was in Paris. No one seemed to care about chassis numbers. Burden the Martin told me the same thing about the Elvas he imported and sold. More’s the pity. 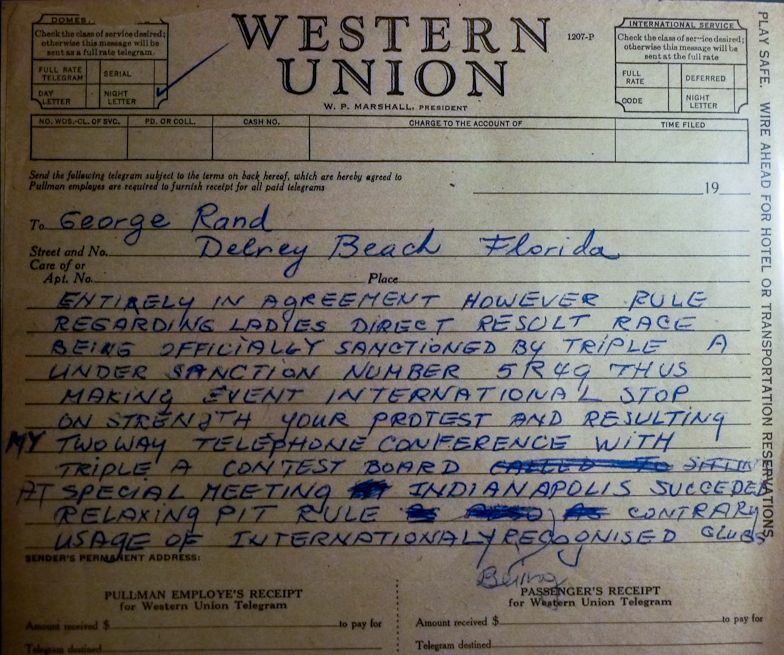 I’ve copied the Formula Jr. info from the 1962 Time Sheet booklet and sent it to you separately. Chuck crashed (the time sheet notation is ‘Collision’ and ‘Sand Bank’) on lap 10 of the 25 lap race. Pigot[t?] led every lap from pole. Thanks for asking and I hope it helps. There is some correspondence related to bringing Deutsch Bonnets to race in ’55 (and a nice Christmas card from Rene Bonnet). They were contingent upon getting some support from a US backer, I think it was Firestone, to bring the car(s) but it fell through. Alec Ulmann was an exporter and facilitator primarily of aircraft and aircraft parts, so he was in Europe frequently on business. There are letters and telegrams to and from him in hotels all over Europe. Rick, I’m glad you were able to secure these important archives and hope that you might be willing to share a portion of your find with the International Motor Racing Research Center in Watkins Glen. 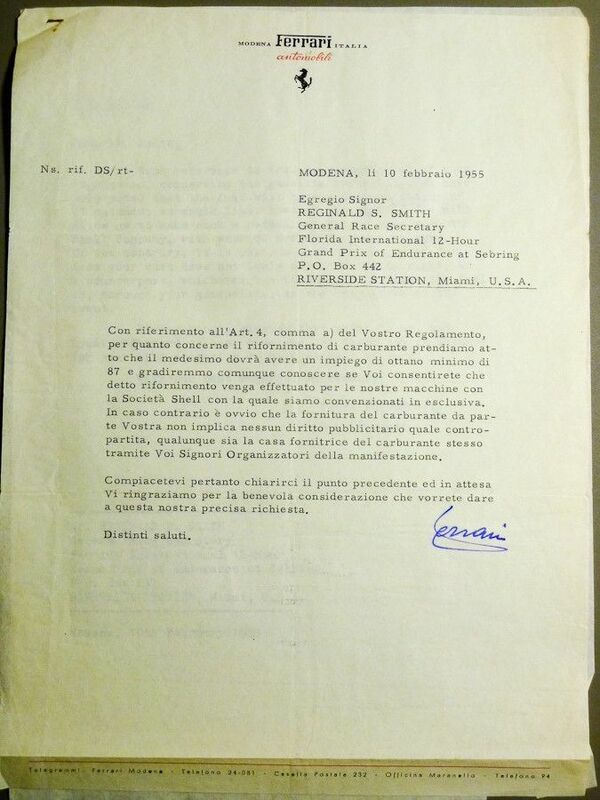 Some of your material has significant retail value, such as the 1963 programs and letters from Ferrari while some of it has historical archival value such as actual race records. Please keep the IMRRC in mind as you decide what to do with this treasure trove. Terrific that a true expert has these Treasures and hopefully and do “the Sebring Book.” T.I.D.E. Ferrari racing, palm beach, Tom I. Davis, Enterprises. In the “Sebring papers”, any mention in 1960 or 1961 of the Camoradi entries? So far I don’t recall seeing any Camoradi correspondence, but I’ll keep your interest in mind as I continue to go through things. There is a lot of it. What a find! I am sure you are having lots of fun digging through the papers. 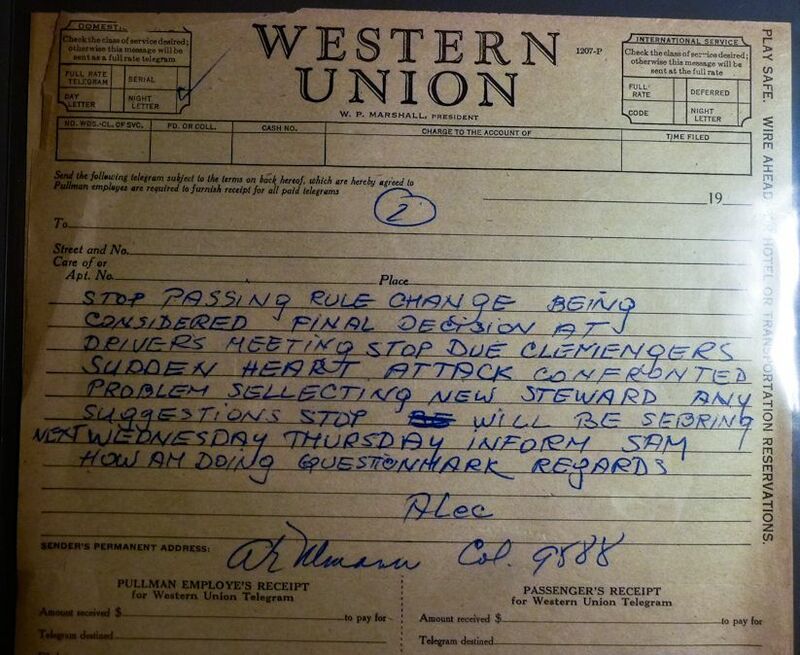 I am actually looking for papers relating to Alec’s sister Nina Ulmann (also Volgenski, also Rachinsky). She lived in Europe but had an art pottery in LA in 1926. If there’s anything at all about her, could you let me know? My email is olga at bluebytes.com. I just stumbled upon your article about the Sebring collection and was surprised and delighted to discover there was such a thing! Seven years ago I purchased a ’59 Triumph TR3A and although the original owner had passed, I spoke to the other two owners who both confirmed that my car was featured on the cover of a Sebring publication. It seems that owner #3 whom I bought it from, had the magazine passed to him via the original owner and owner #2. Unfortunately, this guy went through a messy divorce and his wife destroyed it. Ugh! The original owner of the car was a pilot for Braniff Airlines, a Captain Eugene “Pete” Burch. He picked the car up at the Triumph factory in February of ’59 and toured the UK on one of Triumph’s factory rallies before having it shipped to Florida. Captain Burch kept meticulous service records which I have. He was also rumored to fly the car to Formula 1 races and in fact I have a ticket from a race in Argentina. I have been searching in vain for years and years, looking for that publication. Neither owner #2 or #3 can remember what publication it was. They each thought that my car was a “parade” car which is why it was featured. To my knowledge, Sebring didn’t have parade cars but perhaps it was some special program by SCCA or some other organization. Owner #2 was a big Sebring fan with a personal parking spot and swears it was in 1959. Owner #3 wasn’t so sure. My car was recently in the Hemmings magazine “Sports and Exotic” where I appealed to the readers to contact me if anyone knew anything about the car or the magazine in question. If you have anything in your collection with a 1959 Triumph TR3A, Pale Yellow, with a bullet mirror on the cowl and the UK license plate on the front reading: UWK 976, that’s my car. I would be interested in purchasing that publication which help you get back a few of those hard earned dollars that you parted ways with at the auction! I only now stumbled on this post. Thank you for stepping up to acquire and preserve these papers. I don’t know if you have read Alec Ulmann’s book, The Sebring Story, Chilton Book Co. (1977), but it should make a good companion and resource to read alongside your archive. You have a significant investment in Ulmann’s papers, so capitalize on that as you see fit. When you have done so, you might consider donating them to the International Motor Racing Research Center in Watkins Glen. 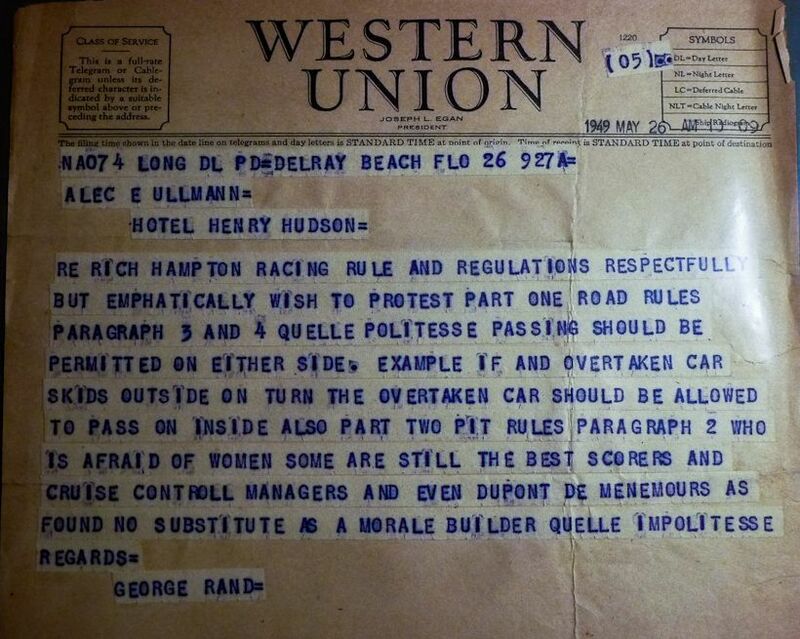 I received a small archive of documents from Wade Morehouse, co-driver of the Index of Performance winning Deutsch-Bonnet #25 in the first 12 hours of Sebring (1952). After making copies for his family and myself, I donated them to IMRRC. IMRRC are amassing an important collection of original materials and keep them indexed by donor and subject matter for the benefit of future researchers. My favorite was John Fitch in the Cunningham with a picture of his girl “Elizabeth” on the dash with “Twelve hours of racing ahead with a fast car behind and in front. What more could you ask for? ” I hope I got it right as Briggs Cunningham and John Fitch will always deserve the best. I had Alec’s book but it perished in my barn. I only stumbled in this post and wondered, if there is any information about the Austin Healeys that raced Sebring 1960.